A short test video has been posted on YouTube of the JRollon Bombardier Canadair CRJ-200 in the X-Plane 10 demo. The freeware Dornier Do 328 Turboprop for X-Plane is now available to download at X-Plane.org. OpenVFR has released new areas in the Asia, Africa, South America and also Europe regions for FSX. McPhat Studios has posted another preview screenshot from the PMDG 737 NGX - United (UAL) HD Textures. LatinVFR has posted more work in progress screenshots from Miami International Airport (KMIA) for FSX and FS2004. KC Flight Shop has posted new preview screenshots from the upcoming Republic RC-3 Seabee for FSX. FSGenesis is offering 60% off everything in the FSGenesis Online Store. Valid through November 27th 2011. Drzewiecki Design has posted another teaser screenshot from the upcoming Kraków Balice 2011 (EPKK) scenery. Carenado has posted the first preview pictures from the upcoming Cessna C185F Skywagon for X-Plane. RB Design has converted Swedflight Pro Airports ESGG, ESMS, ESSA, ESPA and EKCH for X-Plane. The freeware Corsica scenery for X-Plane has been updated, and is now available to download at the XPFR Website. Ben Supnik has posted a short article concerning frame rates in X-Plane 10 on the X-Plane Developer Blog. Just Flight is now offering a 20% discount on all software during this years Christmas Sale. Sale ends January 4th 2012. MilViz has released the long awaited McDonnell Douglas F-15E Strike Eagle for FSX. Details on the Product Page. -Highly detailed Pilots Operating Handbook: includes all performance charts and figures. If you choose to, you can fly by the numbers, or fly as casual as you wish! -High quality sound set recorded from a real F-15E. -Flight dynamics tested and tuned by a real pilots. The aircraft flies just like its real world counterpart! -Aircraft features an exterior model manager that enables you to load different weapons and fuel tanks. Weight distribution and fuel will be added or subtracted as you add or remove items. -Ability to hide the stick in 3D VC enabling the pilot to access certain switches normally obscured from view by the yoke. -AI pack with enhanced airbases will be released later this week! QualityWings has posted another teaser screenshot from the cockpit of the upcoming Boeing 787 for FSX. Oryx Simulation has posted the first development previews from Castlegar Airport (CYCG) for FSX. Lionheart Creations is offering half price on all aircraft during the Thanksgiving Weekend Sale. LatinVFR has posted new work in progress screenshots from Miami International Airport (KMIA) for FSX and FS2004. IRIS Simulations has posted more preview pictures from the upcoming F-15E Strike Eagle for FSX. Free G.E. (Google Earth) Flight Simulator has been updated to version 0.71. More information at G.E. Flight Simulator. Coolsky has posted several close-ups from the cockpit of the upcoming Douglas DC-9 for FSX. Alabeo has posted the first preview video from the upcoming Pitts S-2S Special for FSX. Aerosoft has posted a video demonstration of the air restart procedure on the Rockwell OV-10 Bronco for FSX. Mark Aldridge has released version 5 of the freeware Frankfurt am Main Airport (EDDF) for FSX at AVSIM. Trieng-Trieng has released freeware Mogadishu Aden Adde International Airport (HCMM) for FSX at AVSIM. Click here to check out all available Black Friday Sales at SimMarket. Expires November 27th 2011. Pacific Islands Simulation is offering a 40% discount during the Holiday Season Sale. Valid until December 31st 2011. QualityWings is offering a 30% discount on the The Ultimate 757 Collection. Valid through November 28th 2011. McPhat Studios has posted another preview screenshot from the PMDG 737 NGX - Air Berlin (BER) HD Textures. Orbx has released Goheen Airport (W52) for FSX. More information and purchase at the Orbx Website. FlightSim Pilot Shop is holding a Black Friday Mega Sale with 50% off on over 300 items. Valid through Nov 28th 2011.
feelThere has released a promotional video for the upcoming Tracon! 2012 ATC simulator. feelThere is offering 30-60% off on select titles during the Thanksgiving Supersale. Valid until November 27th 2011. Robert S. Randazzo from PMDG has posted details and status update on the upcoming Boeing 737NGX Service Pack 1b. FSAddon has released the completely overhauled Ben Gurion Airport (LLBG) V2.0 for FSX. Available at the FSAddon Store. Alabeo has posted the first pictures from the upcoming Sukhoi Su-26 for FSX at the Alabeo FB Page. Aerosoft has released update version 1.10 to the PZL-104 Wilga for FSX. Details at the Product Page. 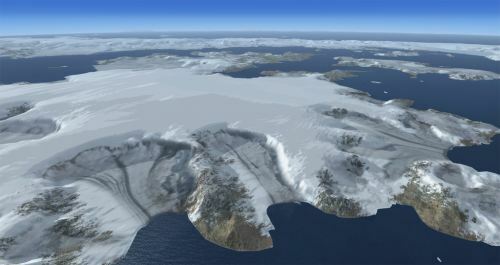 Aerosoft has released the long awaited Antarctica X scenery for FSX. Now available at the Aerosoft Shop and SimMarket.